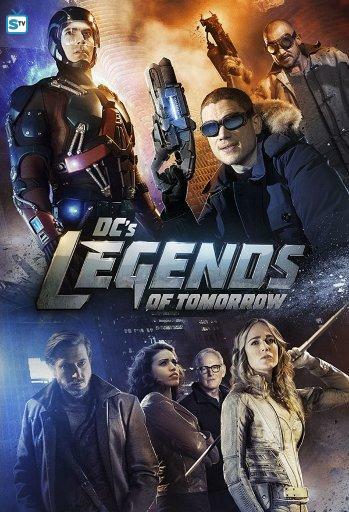 If you begin watching Legends of Tomorrow without first watching Arrow and The Flash, it will make no sense whatsoever. The first two shows do a great deal to set up the third, including introduce and develop most of the heroes and villains. And if you don’t watch each season concurrently with the other two shows, you will still get lost more than once, and not only in the crossover episodes. Legends may well be the epitome of the Arrowverse’s greatest flaw: the shows rely on each other far too much. This is why I am perfectly happy having the various properties of the Marvel Cinematic Universe exist largely independent of each other. Outside that flaw, one must at least try to discuss the show on its own merits. The premise of the show is, basically, there are terrible villains who either live very long or possess the power of time travel, and so combating them requires also traveling through time. To that end, a collection of heroes and antiheroes, the Legends, has been assembled to travel through Earth’s history and preserve it from those who would do serious harm. Unfortunately, they tend to mess things up themselves as frequently as they fix them, adding to their own workload. Their continued success and general survival is a testament to their skills. From the beginning, I was impressed by how personal the Legends’ adventures were for them. Traveling across the world and across ages, it would be easy to lose any connection between the heroes and the circumstances they find themselves in. Yet, instead, they’re consistently finding themselves being pushed to the limit, driven by their emotions and convictions, and investing themselves into what’s happening immediately around them. The fate of the future is at stake, but that is only a reflection of what lies within the Legends’ hearts. That said, the first season had terrible issues with how campy it was, not least of which was the villain of that season, Vandal Savage. This is one of the most formidable entities of the DC Comics’ universe, and one whose introduction into the Arrowverse required several superheroes working together to bring him down. But the Legends kept whipping him, and no matter how menacing he might be to most regular people, by the end, he just wasn’t so threatening anymore. The second season was much better. They may have dredged up some villains we would have been happier to never see again, but the Legion of Doom was still a massive upgrade. For one thing, their menace and danger remained, and even increased, right up to the last moment of the climax. As such, they were perfect for, again, driving the Legends to the limit. And finally, it made for a heart-wrenching moment, for the outcome to come down to something so personal and powerful for one of our favorite characters in the Arrowverse. Excellently done. Still, for being so personal, there’s a lot that happens “just because,” and that goes into how campy it is. The characters are entertaining, but what they’re doing isn’t always. And, like the rest of the Arrowverse, the couplings tend to “just happen,” and not all of them, or really many of them, are worth shipping. Actually, I think Legends has had only one coupling, incredibly brief, that I liked. As the show has only been going for two seasons at this point, there’s not much else to say, really. I do like the characters, they are entertaining and appealing and funny. I like the action, usually, and the plots. And I absolutely love Caity Lotz as Sara Lance, the White Canary. But, still, it has a long way to go before it’s “great,” and I fear it will never be so as long as it relies so thoroughly on the rest of the Arrowverse to support it. This entry was posted in Tuesday Review, TV Shows and tagged Arrowverse, Legends of Tomorrow. Bookmark the permalink.